Listen Local, Save the Planet? Here's last Sunday's sermon, part three in our series on the Kingdom of God. Our text was Luke 9:28-36. This is the next sermon in the series on the Kingdom of God we've been working through at the FreeWay. Our text was John 3:1-15. Drove the 401 the other day and thought of you. The living line of metal crawling east and west as far as I could see probably had more cars in it than all of Caronport, and I had to pinch myself to convince myself I was there. Remember the good old days on Highway 1? When a broom-handle in the steering wheel and a brick on the gas pedal was almost enough to get us to Regina? There was a report on the radio while I drove, Saskatchewan, about the people flocking to you from here for work and industry. The lady in the interview spoke in apologetic tones as she packed her bags. "If I told my friends I was going to Vancouver, or Edmonton, or Calgary," she said, "They'd understand. But when I say Regina... they say: 'Why would you want to move there?'" Go easy on her when she gets there, Saskatchewan: pour the prairie in slowly, like you did for me. Don't get me wrong, I like it here. And there is something pretty poignant about being "from the West." The Elves of Middle Earth were from the West, you remember, and their hearts always ached for it. I can hum lines like "There's a feeling I get when I look to the West, and my spirit is crying for leaving," with real meaning now; and I can mumble lines like "though the last lights off the black West went, the morning at the brown brink eastward springs" with real knowing. But when I got to the barbers and he learned I was Moose-Javian, he said: "I've never been out west. Is it really as flat as they say?" I laughed and said: "Yeah, and the telephone pole is the provincial tree..." Not to betray you, Saskatchewan, but I felt I would have only betrayed you more if I tried to explain. How could I explain what it's like, to stand at the edge of town and see the whole world, green and gold and hay-scented, stretching out around you, spread out like some great, shallow earthen-ware dish, filled to the very edge of its delicate, distended meniscus with unfiltered light? Well, I'll try to keep in touch, Saskatchewan-- I'll try to think of you whenever I catch real glimpses of open sky-- and I'll try to keep the crawling lines of metal from wringing the prairie out of me completely. But while we wait and see, take care. 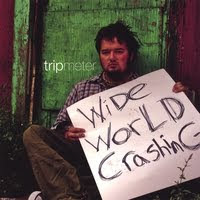 Those of you who stop in at terra incognita on a somewhat regular basis may have noticed that September's CD of the month was this one: Wide World Crashing by tripmeter. Never heard of tripmeter? CDBaby describes their sound as "up-tempo melodic rock with soaring vocals, rich guitars and creative rhythms. In short: well-conceived songs in captivating and clever arrangements." Recommended, they say, if you like: Foo Fighters, Mute Math, Nine Inch Nails. Well, I don't really know Foo Fighters, Mute Math, Nine Inch Nails (in the words of Grandpa Simpson: "I used to be with it, but now what's 'it' seems strange and scary to me... it'll happen to you..."). But I've really grown to love the energy and edginess of this album. From the tintinabular peals of "My Addiction's" opening riff, to the pedal-to-the-metal drag race of "Drive to the Sun," to the ominous-but-hopeful vision of "Somewhere" (Somewhere, you can find the heart to beat this... no one gets left behind without good reason...), there's a lot to feast on, aurally speaking. But it's not just that. The thing is: I know these guys. They were all students at Briercrest college during my days there. Took Greek exegesis with the drummer (the guy parsed irregular Greek verb forms with as much flare as he syncopates the down-beat). Was in a small group for a while with the lead guitarist. Even the guy on the cover-art was my next door neighbour (helped him when the waterlines of his trailer froze one 30 below morning on the prairie). And it's this human difference that makes me love this CD. It's the same difference that makes me love home-made soup over Campbell's Chicken-by-Product Noodle: the difference between what's bagged and canned and mass-produced for anybody and nobody, and what comes to us as a gift from hands we know, have shook, have helped to jump-start their frozen car (another 30 below prairie morning with my neighbour). It's why I love independent music. And I'm not talking about the kind of "independent" music that's really just a niche-market genre gimmick out of Nashville or L.A. or where ever it is that "indie rock" comes from. I'm talking about music that grows out of the lives and hearts and heads of the people next door, down the street, in our communities, in our neighbourhoods, in our lives. In his book Deep Economy: The Wealth of Communities and the Durable Future, Bill McKibben develops a pretty cogent argument in favor of making economic choices that promote small, community-oriented, human-scale thinking over the more/massive/mass-market world that we've grown to expect and accept. He argues (again cogently) that the more/massive/mass-market world is pretty de-humanizing after all, and unsustainable anyways, and if we're really serious about building a durable future, we're going to have to start thinking locally. You know: buy locally-grown food and locally-produced goods from the hands of real people that you can actually shake. McKibben doesn't stop there, though. He goes on to argue (still cogently) that part of building a durable future will include community-oriented, human-scale choices about our entertainment. If we can build community and a sense of place by supporting local entertainment (like our music, theatre, sports, and so on) we might discover a world where words like "more," "massive," and "mass-market" are no longer synonyms for "better." And this world, he argues, is the kind of world we'll need if we want to build durable and sustainable economies in the coming years. Well. I don't know if I'll really save the planet by listening to tripmeter, but it's nice to muse. And there's still this: whenever I hear Wide World Crashing, suddenly I'm strolling again along that back alley behind the Sparrow Gardens arena where so many Briercrest bands have had rehearsal space, savouring the muffled sound of rock-dreams thumping through the walls- and whenever I listen to my friend Dale Dirksen's These are the Days, I'm sitting with him again in his office, musing about music and minsitry and life together- and whenever I listen to that rough-around-the-edges worship CD we produced at my old church, I'm there again trading chords and words and laughs with people I love. I'm grounded. I'm anchored. I'm home. And the Musik Biz doesn't produce a can of alt-rock-indie-fusion-pop that you could open for this kind of aural experience. Some time in the mid-seventh century, an Anglo-Saxon herdsman living in the monastery of Streonæshalch (on the north-east coast of England) had a dream. The monks of the monastery were at feast that night, singing and harping, but because he knew no poetry, Cædmon had wandered off early to sleep in the cattle stall with the animals he tended. In his dream, "someone" approached him, calling him by name and beckoning: "Cædmon, sing me something." Knowing no songs, Cædmon refused, but the "someone" insisted: "All the same, you have to sing for me." "And what must I sing?" "Sing principium creaturarum"-- The beginning of Created Things. Immediately Cædmon's mouth was opened and he began to sing praises to the Creator. Verses he had never heard before sprang out of him, verses for the Christian God, but sung in the (till then mostly pagan) poetic tradition of his country-men. eternal Lord, the Beginning established. for men, earth, the Master Almighty. Cædmon woke with this song ringing in his head, and shared it with his foreman. The foreman took him to the abbess of the monastery, who in turn affirmed it as a gift from God. Cædmon took monastic vows and began to receive instruction in Christian doctrine, learning the "whole sequence of sacred history" which he would convert into sweetest song, song "so delightful that he made his teachers, in their turn, his listeners." He died a revered poet-saint. But there's something haunting here in this ancient story of a simple herdsman, meeting with the Christian God and finding his mouth filled with distinctly Anglo-Saxon praise. "Cædmon, sing me something" called the Spirit of Christ in the stable that night; like an altar-hot coal he touched Cædmon's lips, inspiring him to translate that touch into the rich poetic tradition of his own culture. And there, in the alliterated syllables and Old English kennings of Cædmon's hymn- now must we praise heaven-kingdom's Keeper- the Measurer's might and his mind-plans- we can hear the Spirit calling out once more to all the nations, tribes and tongues of the Earth. "Come," it cries: "Bring to me the richest and finest and most lovely your culture has to offer- its verse, its song, its art, its craft. Bring it now through the gates of the New Jerusalem. Lay it here at the feet of the Christ of God and find it divinely-claimed, blood-bought, purified and perfected there." "Come Cædmon, sing me something." Started a new sermon series at the FreeWay this Sunday on the Kingdom of God. Here's sermon one of six. I suppose after my last post, the next logical step would be to muse a little about the revenge effects of the various technologies we've introduced to church ministry itself. When the Gutenberg Press took the Bible out of the hands of the priesthood and put it firmly into the hands of every believer-- with the laudable intention of building biblically literate, thus better, Christian communities-- I don't suppose anyone could have guessed that it might also be putting deep cracks in the foundations of Christian community, by pushing the individual's "interpretation" of the Good Book to the centre of Christian experience and pushing the community to the edge. Did Gutenberg get its revenge (mused the blogger) by filling the pews with a hundred personal popes piously practicing their private versions of the Faith, ready and able to leave when the interpretive going got tough? Is the embarrassing fragmentation of the church today part of the Gutenberg legacy? Not that I would want to go back to the gloom of the pre-Gutenberg era, mind you... any more than I would want to go back to my pre-HTC Dream life... but perhaps if we can name the unintended effects of our technology, we can make more informed choices about when, why and how to use it. So, off the top of my head, here are a few possible "revenge effects" of technology in the Church. In an effort to make our preaching more effective, we've introduced a variety of presentation technologies behind the pulpit. Has this had the unintended effect of shackling our sermons to ideas that fit neatly on to PowerPoint slides and shackling our preachers to what's written on the screen? In an effort to make our music more engaging, we've replaced hymnals with screens. Has this had the unintended effect of alienating people from the songs they're singing because they no longer have the music in front of them? In an effort to make worship more dynamic, we've amplified everything. Has this had the unintended effect of deafening us to the voice of God and the voices of each other in our gathered times? In an effort to make our faith more "relevant" we've introduced a wide variety of media to our worship, from video montage, to film clips, to Christianesque imagery moving behind the song lyrics on the PowerPoint slide. Has this had the unintended effect of making us less able to recognize the deeply relevant but counter-cultural aspects of life with God (things like stillness, Sabbath, quiet, simplicity)? These are real questions, not just rhetorical points. And even if the answer is "yes" to any of them, that doesn't mean the technology itself must go (*just wait, I'm getting a call on my phone*). But if we can see the "revenge effects" of our own cleverness like this, we will also begin to see, I think, the limitations of our cleverness. And to see our own limitations is to take a humble step towards deeper dependence on God. One of the things I've found indispensably useful since starting my new life as a pastor is my new HTC Android Dream Smart Phone. I say this with not a little sheepishness, because for a long time I held out against cell phones on principle. And now, here I am, with no mere cell phone, but a touch-sensitive cellular communications device with instant access to email, gmail, text messages and chatting, roaming internet, youtube viewing and GPS capabilities. It's like going from a pedal bike to a Porsche over night. Now I say I held out because for a long time I had this sense that cell phone technology stunted the growth of genuine community by making us so independent and self-sufficient that we no longer need to have any real connection with the actual flesh-and-blood human beings around us. For example: time was when my car broke down on the side of the highway I would have to knock on the neighbour's door and ask for help; and more often that not, they would. Now I can call nameless, faceless roadside assistance from the comfort of my car (and view a variety of inane Youtube clips while I'm waiting for them to come). I was talking about this with a friend a while back and she told me that she found her cell phone helpful because when she had to walk home from her university classes at night and felt unsafe, she could call her dad to come meet her. Then she said: "Of course, if I didn't have the cell phone, I'd have to get to know the other students in the class well enough that I could walk home with one of them..." And I think that was my point in the hold-out days: I felt that roaming communications technologies like cell phones allowed us to seal up our spheres of influence so tightly that the strangers around us never had to be anything more than strangers. And maybe there's a kernel of truth there. But here I am with my HTC Smart Phone and finding it, as I said earlier, indispensably useful. But I'm also wondering about the revenge effects of such technology. Author and social scientist Edward Tenner argues that all technologies have a natural tendency to "bite back" with "revenge effects" on the societies into which they are introduced. His theory is that societies are really just systems that constantly seek the "status quo." He suggests that as new technologies significantly upset this status quo, the system itself will naturally adjust in unexpected, unintended, even unconscious ways to counteract their effect, and so maintain the status quo. Example 1: As we introduce a plethora of ingenious time-saving appliances to the kitchen, the system adjusts to maintain a status quo of business: once it's been freed from meal prep-and-clean-up hours, it's possible to overload our evening schedule with other things, and so we find ourselves busier than ever. Example 2 (and perhaps more to the point): As communications devices make communication increasingly clear and easy, we find our actual communicating and decision-making processes more (not less) cloudy and confused because now everything has to be answered and decided and acted on under the tyranny of the now. I'm not sure if Turner's on to anything or not (though they say that the advent of email has significantly increased-- not decreased-- paper consumption in the office workplace). But I do know this: the other day a friend called me at home and when I picked up the phone he said: "Finally found you." He'd tried my gmail, left a message on my voice mail, called my office phone, and when he couldn't get me at any of these he tried me at home. All the ways to connect with me, it seems, had actually made me harder to find. Vengeance is mine, sayeth the HTC Dream.